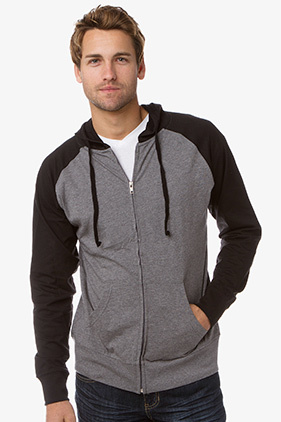 The prefect lightweight, and oh so soft, jersey hooded pullover. 60% ringspun cotton/40% polyester 30 singles yarn, 4.5 ounce lightweight . Raglan sleeves. Unlined hood. Split stitch double needle sewing. Twill neck tape. 1x1 ribbing at cuffs & waistband. Sewn eyelets. #5 dtm coil kissing zipper. Front pouch pocket. Slim fit.